Three-seat sofa designed by Hans J. Wegner model "GE-240/3" also known as the "Cigar" due to the shape of the armrest. Produced by GETAMA, Gedsted in Denmark during the 1950s. 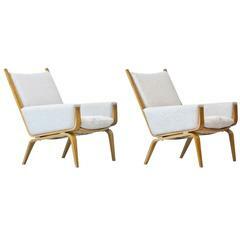 All original frame and wool upholstery from the 1950s. One side with contrasting wide striped fabric in shifting red and black tones. Amazing original condition with very few signs of wear and light age related patina. "The Cigar" three-seat sofa, model GE240/3 designed by Hans J. Wegner and manufactured by Getama in the 1960s. The sofa is of teak and upholstered in dark blue Hallingdal.